There is something to be said about a truck that refuses to give in to frills. One that prefers to the formula of what came before. After all, that's what got it here in the first place. And this truck is one of those formidable few: built in the style of the original, with a few minimal upgrades, ready to enjoy the sweet life near Florida's Northeastern shore. This Land Cruiser's original armor gives it that iconic shape you'd know from anywhere. Here, every detail is crafted in the spirit of the original, from its factory-style soft top, to its shiny Toyota hubcaps. Its steel body finished in Olive, with contrasting silver accents and heritage-style badging. When you buy a classic car, you buy for the look. The feel. And the sound. And that Toyota 2F engine under the hood, is unlike any engine out there today. Paired with a 5-speed manual transmission, this finely-tuned warrior runs better than ever. New suspension, front disc brakes, and power steering further refine the ride. The interior cabin of this Land Cruiser is comfortable, yet rugged - perfect for the Florida tropics. Seats and door panels are lined with water-resistant vinyl, which contrasts beautifully with the Olive-painted dash with its retro knobs and gauges. Vintage Air climate control keeps the Florida heat in check, while the hum of the classic engine supplies the soundtrack to every journey. Ready to Catch the G40 Wave? 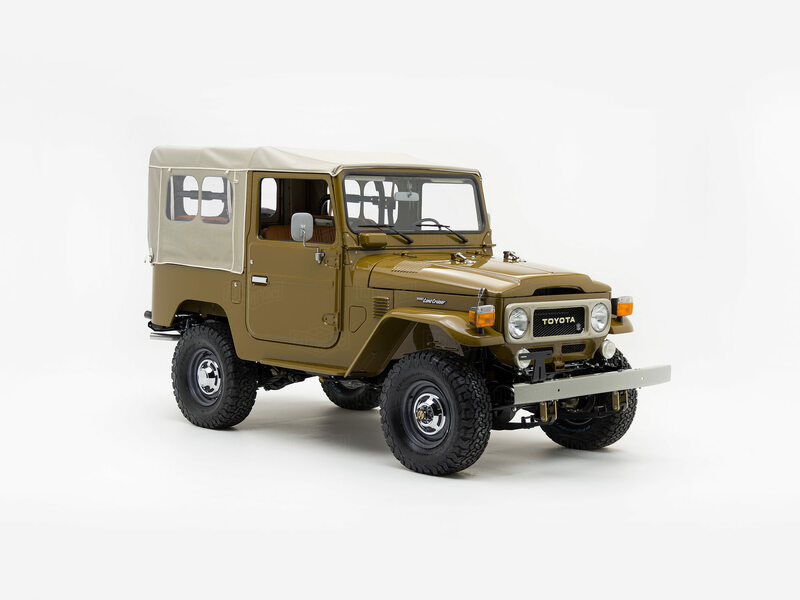 With a 1GR-FE engine and iconic looks, the G40 Heritage by The FJ Company is an amped up version of the classic beach ride. Customize yours!